We receive many enquiries from organisations that need to develop embedded systems in compliance with international safety standard ISO 26262. In recent months, the main requirement has been support for the development of components for use in ‘Advanced Driver Assistance Systems’ (ADAS) and ‘Autonomous Vehicles’ (AVs), typically at ‘ASIL D’. In our experience, a highly-effective way of improving confidence in the safety of such complex designs is to use a ‘TT Wrapper‘. 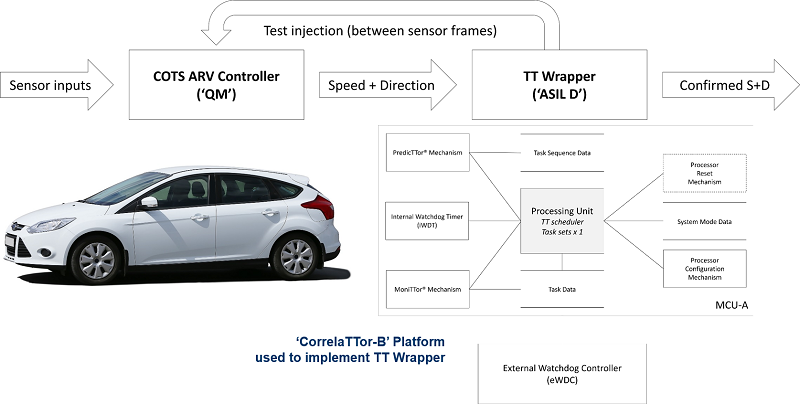 We say more about the use of TT Wrappers in ISO 26262 designs on this page. In this video, we assume that a controller for an ‘autonomous vehicle’ (AV) has been developed. We further assume: [i] that the AV controller was developed carefully, but the work was not conducted in compliance with ISO 26262 (the relevant international safety standard); and [ii] the AV controller cannot be assigned an ‘ASIL’ rating: it is considered to be ‘QM’ rated. In order to improve confidence in the safety and reliability of the AV, we will add a ‘TT Wrapper’ to this design. In combination, the AV controller (‘QM(D)’) and the TT Wrapper (‘ASIL D(D)’) will allow us to achieve ISO 26262 ‘ASIL D’ requirements quickly and cost effectively. The techniques presented in this video can be applied with a wide range of Advanced Driver Assistance Systems (ADAS) and many other automotive designs. The ‘TT Wrapper’ example presented on this page is based on a SafeTTy Solutions™ Package (SSP-RTL4). SafeTTy Solutions Packages are designed to help your development team produce a safety-related embedded system quickly and cost-effectively, in compliance with one or more international safety standards (such as ISO 26262).